This article covers FUZE Card, a Bluetooth-enabled reprogrammable credit card. The size and shape of a regular credit card, FUZE promises to be "your whole wallet in one card." After receiving a FUZE Card from @MBHbox (his blog), I decided to take a careful look at it. In the process, I X-rayed the card, fully reverse engineered its Bluetooth protocol, and found a security vulnerability that allows credit card numbers to be stolen via Bluetooth (CVE-2018-9119). ICE9 reported this vulnerability to BrilliantTS, the maker of FUZE, but they did not respond to repeated follow-ups and did not take action on the basis of our report. As of this writing, CVE-2018-9119 continues to be exploitable on production FUZE Cards in the wild. Update 2018-04-07: BrilliantTS reached out to ICE9 and informed us that they were already aware of this issue and are planning to release an updated firmware on 2018-04-19. They have also added a security@fuzecard.com email address so issues can be more easily reported in the future. Refer to their security notice for further details. I applaud BrilliantTS for taking steps to remediate this issue once it reached their attention. Feel free to skip directly to the vulnerability and exploit if you are impatient. FUZE is an IoT device the size, shape, and thickness of a normal credit card. You program credit cards into it via Bluetooth (BLE) using a smart phone app. When you go to pay, you use the buttons and e-Paper display to select which card to emulate. The magnetic stripe reprograms itself to impersonate that card, and then FUZE can be swiped like a regular credit card. To configure FUZE and add or remove credit cards, BrilliantTS publishes an app called eCARD Manager. To add a card, you must swipe it on your phone using an included card reader that plugs into the headphone jack (like a Square dongle). I found this process to be extremely unreliable, taking in excess of 20 swipes to finally accept my card. BrilliantTS claims FUZE can hold up to 30 cards. FUZE does attempt to provide some level of security. When you set up FUZE for the first time you are prompted to configure a passcode as a sequence of six button presses, although this step can be skipped. With a passcode configured, the device remains locked unless you manually unlock it or your smartphone is nearby. In the locked state, you can't access any of the data on the card or program the magstripe. It also has a higher security mode in which the card will only function when it is connected to a phone via Bluetooth. Based on promotional images on their site, BrilliantTS plans to release a version with EMV (chip) support. At the time of this writing, only the magnetic stripe version is available. The card also contains NFC circuitry to support contactless payment, but this does not work with the latest firmware. I wanted to get an understanding of how the device was built. With a typical IoT device, this usually involves removing the case with a few screws or a spudger and taking a glance at the PCB. At worst you're foiled by an epoxy-encased die. In the case of FUZE, the device is a solid construction that is a mere 0.03" thick. It may be possible to very carefully remove the plastic packaging, but I only had one and did not want to risk destroying it. From the image we can see some key features of FUZE's architecture. The main chips on the board are a microcontroller, an e-Paper driver, and a Bluetooth SoC. A number of features are present on the board but are not used, including NFC and EMV (chip card support). The footprint of the Bluetooth chip is some BGA variant, and the ball land pattern is somewhat unique. With a little sleuthing, Alvaro Prieto[twitter] was able to pinpoint it to the CSR1013. Similar to the nRF51, the CSR101x series is a complete system-on-chip (SoC) with the ability to run custom code. Some of the application code likely lives on the CSR1013. The microcontroller is an unidentified 68 pin QFP. The bulk of the application likely runs on this, including the code for displaying the screen, button input, and yet-to-be implemented NFC and EMV functionality. 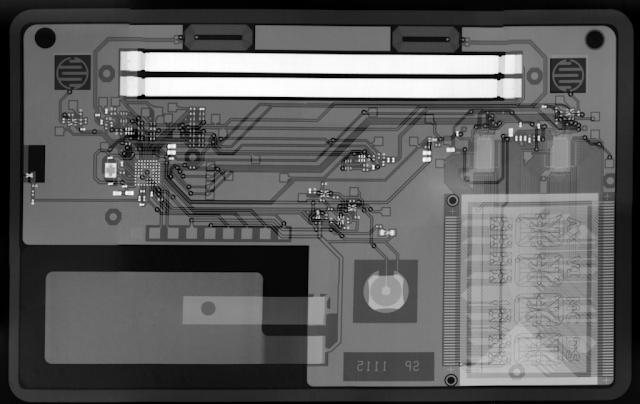 The QFP next to the microcontroller is likely a driver for the e-Paper display. BrilliantTS plans to release a version of FUZE with EMV support, and their site has marketing images of that variant of the card. It is interesting (but not surprising) to note that they use a single board design for both cards. On the magstripe version of the card, the plastic packaging simply covers the smart card contacts for EMV. A bit of Googling does reveal some press release and marketing photos showing the inside of the card. A review on Seoul Space shows a bare board for a prototype version of the card, and FUZE's main site includes a promotional photo of the hardware stackup. 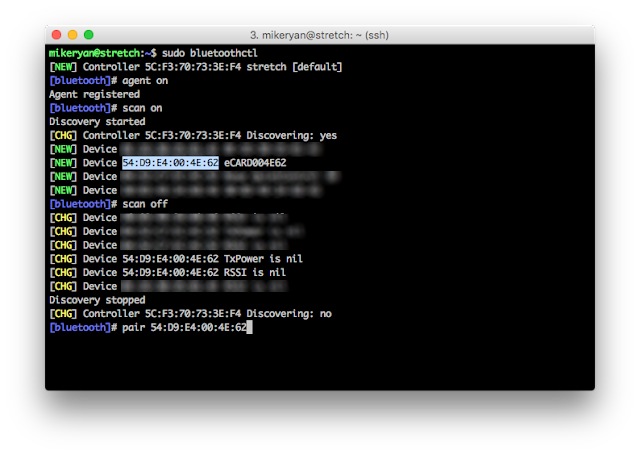 Android is absolutely indispensable for performing a blackbox analysis of a Bluetooth device. Out of the box, we can log all Bluetooth traffic from an app to a device. It is also possible to modify app code directly by disassembling and reassembling the Java bytecode, but I didn't have to perform any such app surgery on this assessment. Burp acts as an HTTP proxy and allows you to inspect API requests made by the Android app to backend servers. Although it wasn't critical for understanding how the FUZE card worked, it did provide some clues. Android ships a feature called "HCI snoop log" in the "Developer options" settings menu. Enabling this feature saves all Bluetooth activity on the phone to a file, and that includes every message exchanged between the app and device. 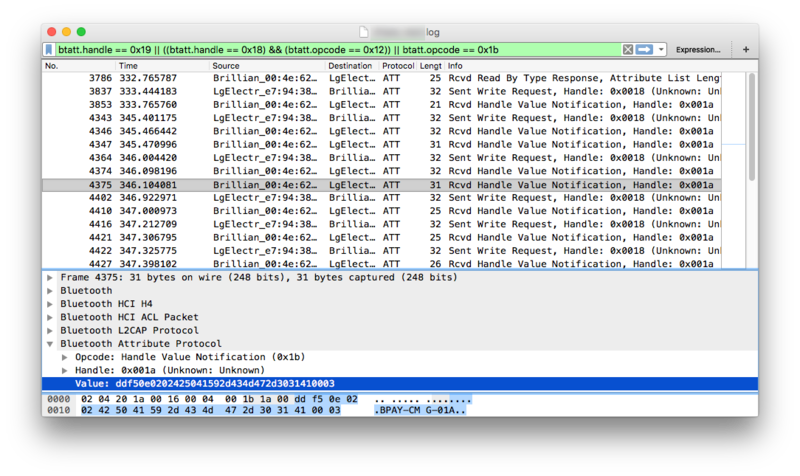 Wireshark can read the files produced by Android's HCI snoop log. It's useful for doing basic analysis and filtering. For bulk and semi-automated analysis I like to export the data to text files and munge them using Perl. Finally, gatttool (and other BlueZ tools) can be used to probe the device directly. It's often useful to take a quick peek with gatttool before even firing up the app. 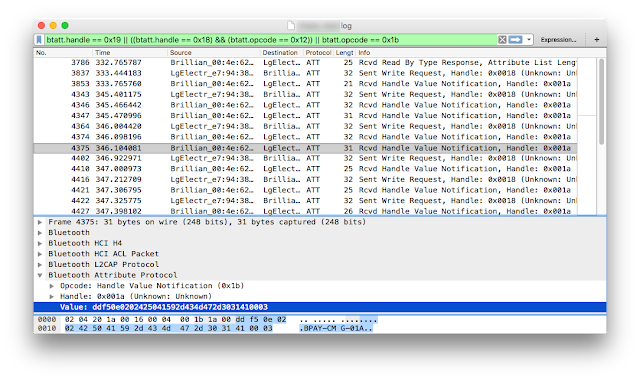 It shines during analysis for experimenting with sending and receiving partially understood protocol messages. Using gatttool to connect to FUZE not work out as well as hoped. Immediately upon connecting to the card, it sends a "Security Request" over the Security Manager Protocol. This is the card demanding that we pair with it, which is actually uncommon among IoT devices in my experience. BLE's pairing protocol is known to be flawed and most devices implement their own security instead of relying on it. FUZE absolutely refuses to send any data to a device that isn't paired with it and isn't using BLE link layer encryption. Loading and filtering the data in Wireshark allowed me to discern that FUZE uses two characteristics for communication: the app writes to the card using write requests on one handle, and receives responses via notifications on another handle. This is extremely common, as it allows developers to treat the BLE channel almost as though it were a TCP socket or serial port. Eyeballing the data in Wireshark left me more hopeful. A great aspect of HCI snoop logging is that the data is captured before it is encrypted by the hardware Bluetooth chip on the phone. The plaintext data included some ASCII strings, and repeated application of step 7 led me to begin to understand some of the protocol format. Wireshark does not lend itself well to bulk analysis, but it provides a rich set of export utilities to allow for post processing. It is a total hack, but I have had the best luck using "Export Packet Dissections" -> "As Plain Text". Before exporting, expand the "Attribute Protocol" dissection to show the data sent over the air. In the export window, ensure "Details" includes "As displayed". Finally a bit of gross Perl turns this into something I can work with. At this point, I revisited gatttool. Using bluetoothctl I was able to scan for and pair with the card. It requires the use of Numeric PIN pairing mode in which a 6 digit number is displayed on FUZE's screen that must be entered in the client (a VM running BlueZ) to successfully pair. Once pairing is completed and encryption is established, the device happily responds to GATT messages over the Attribute Protocol. When sending the first line using gatttool, the second and third lines are reliably sent back. Parsing the data by eye a bit, version numbers become apparent for the hardware, microcontroller firmware, and BLE firmware. As soon as this message is sent, the FUZE lock screen turns off and the main menu appears. This is implemented for user convenience, so the card is automatically unlocked when it is near a paired smart phone. From here it is a matter of staring, thinking, a little experimentation, but mostly staring and thinking. This part should sound familiar to anyone who's ever reverse engineered anything. Ultimately I was able to reverse engineer the majority of the protocol messages: including the message format and supported operations. 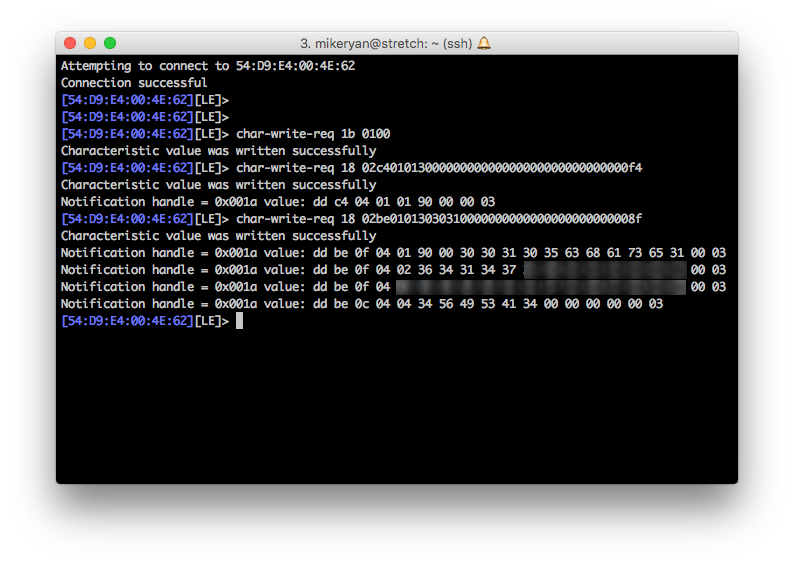 The checksum is calculated by performing an exclusive-or (xor) of all message bytes except the initial 02. Props to Jason Benaim for identifying this highly secure Game Boy style checksum. I looked briefly at the firmware update process, but I did not dive deeply. Since I only have one card, I knew I wasn't going to attempt any firmware flashing shenanigans. I was able to capture two MCU firmware samples by snooping the HTTP requests using Burp. The two samples are both high entropy, nearly the same size, and quite dissimilar in content. This suggests that they are encrypted. Without further analysis, it's not possible to say if they are signed or validated in any way during the firmware update process. The BLE firmware update occurs over CSR's in-house OTA update protocol. I am not aware of any security analysis of this protocol. It would be interesting to study and understand, as I'm sure it is used by other devices with this or similar CSR BLE SoCs. At the time of this writing, the vulnerability has not been patched and remains exploitable on all production FUZE Cards. This vulnerability affects MCU firmware 0.1.73 and BLE firmware 0.7.4, the most recently released versions of both. Update 2018-04-07: BrilliantTS plans to release an updated firmware on 2018-04-19. See the beginning of this article for full details. The attacker must have physical access to the card because of how the card uses BLE link layer security. In addition to encrypting data, BLE link layer security acts as an authentication mechanism. If you aren't paired with the FUZE card, it will reject every message you send to it. Although BLE link layer security has well known weaknesses (also discovered by ICE9), it works reasonably well for FUZE's use case. Where FUZE went right was using the Numeric PIN pairing mode. When you pair with FUZE, the card displays a 6 digit random number on its e-Paper screen. You must enter this on your phone (or Linux attack VM) in order for pairing to succeed. If you attempt to pair with a card that is not in your possession, you will have a one in a million chance of guessing the 6 digit pairing code correctly. Rigorous testing indicated that it was not possible to bypass the pairing requirement, and also it was not possible to downgrade to a weaker pairing mechanism (Just Works) that does not require entering a passcode. Some may argue that the physical access requirement makes this vulnerability uninteresting. I would like to emphasize two points: the first is that handing a credit card to strangers is a normal part of making many types of purchases, so it is impossible to ensure that the card is not tampered with out of sight. Secondly, the card presents itself as more secure than a normal credit card with its use of a lock screen. As demonstrated by this weakness, that is a false sense of security. ICE9 developed a proof-of-concept exploit that can be run from a Linux system or VM. The exploit has been tested in Debian Stretch inside VMware using a BLE dongle via USB passthrough. This attack requires BlueZ to be installed. The first will bypass the lock screen, and the second will read the first credit card number, expiration date, and CVV. The report included a complete description of the vulnerability, proof-of-concept exploit code, and noted that ICE9's standard disclosure period is 45 days. BrilliantTS did not respond to any message after the report was delivered, and the 45 day disclosure period has since expired. As of this writing, BrilliantTS has not released a firmware update for the FUZE Card. For completeness, I will note that the Numeric PIN pairing mode (along with other LE Legacy Pairing modes) is vulnerable to a brute force attack if an attacker is able to sniff the pairing conversation. I consider this an unlikely scenario with FUZE. It's likely that the user will pair in a secure location (such as their home), far from attackers. When they go to use the card, the phone and card use the previously established encryption key. During this phase of encryption, there are no known weaknesses. Nonetheless, as a proof-of-concept, I was able to sniff a pairing conversation and crack it using crackle. Some readers of this article probably remember that FUZE is not the first attempt at a Bluetooth credit card. Way back in the ancient days of 2013, Coin announced a similar product, and delivered it to users by 2015. Fitbit acquired coin in 2016 and killed the product and backend by 2017. From the X-ray it is clear that Coin is a much simpler design than FUZE. Like FUZE, Coin is the size and thickness of a regular credit card and communicates via Bluetooth. It has a simpler TN LCD segment-based screen and only a single button. Even still, it also has a passcode feature similar to FUZE. Unlike FUZE, the battery is not rechargeable, and users were expected to return their cards for replacement every two years. One key way in which FUZE attempts to differentiate itself is by including NFC and EMV support. At the time of this writing, neither of those features is available, so it's a moot point. I never owned a Coin device, so I can't say how its security compared to FUZE. To the best of my knowledge, nobody ever succeeded in extracting credit card numbers from Coin over Bluetooth. However, since the product is completely dead, it's again a moot point. Some IoT ideas are unusually sticky. No matter how bad they sound, someone goes out and makes them. A Bluetooth credit card meets this definition for me. With Apple Pay, Google Pay, and other contactless payments shaking up the payments industry, I don't see a lot of value in a Bluetooth credit card. Even with those options available, I still see myself carrying around ordinary credit cards for the foreseeable future. At the end of the day, the risks of a Bluetooth card aren't worth the questionable convenience benefit. 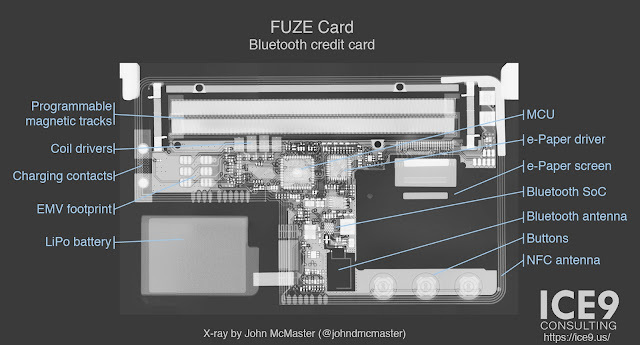 If you would like to hear more and you're in the Bay Area, I will be presenting my research on FUZE Card at the Mountain View Reverse Engineering Meetup (in Santa Clara) on Wednesday April 11, 2018 at 8 PM. ICE9 Consulting is an independent security firm specializing in Bluetooth and IoT. For more information, visit our main site. They have analyzed the issues and have already come up with the action plan and resolution. Visit website at https://fuzecard.com/security_notice.html. They also added a security@fuzecard.com email address so issues can be more easily reported in the future. Do you know if it's possible to write a custom string to the card. Someone mentioned that fuze only emulated track 2 but maybe by writing your ownostring to add card that could be remedied. Is it possible to add a card manually using this exploit? It is possible to write arbitrary track 2 data to the card using this technique.